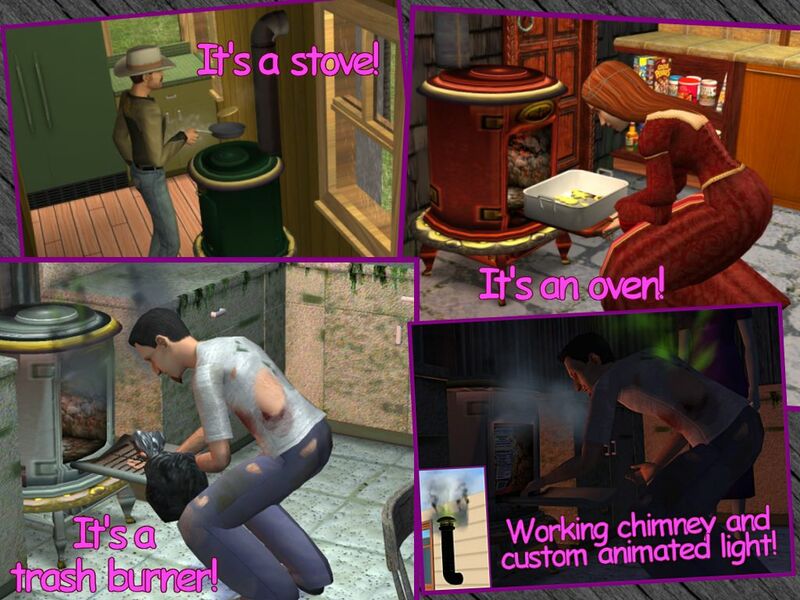 Mod The Sims - Fully animated multi-purpose Coal Stove - *UPDATED 21feb06* - REDOWNLOAD! P.S. The Coal Stove works fine with the OFB, too, but only as a normal "home" stove: it doesn't allow to cook multiple meals. The special custom animation, the fire effect and the custom light just make it impossible to use it in a Business environment. And after all, cooking meals on the Coal Stove is too a slow process, if you are going to use it in your bakery or restaurant. The "Clean" otion now is correctly available whenever the Stove gets dirty, and the meals cooking in the oven can always be taken out. Feel the thrill of a jump into the past! Cook your meals like your grand-grand-mother used to do! Try the GOOD OL' DAYS COAL STOVE! It's a range: you can cook meals on it. It's an oven: from turkeys to Santa cookis, everything can be cooked into the burning cell. It's a trash burner: why burn only coal? All your trash, used dishes, old newspapers and such can be thrown and burnt into this stove! 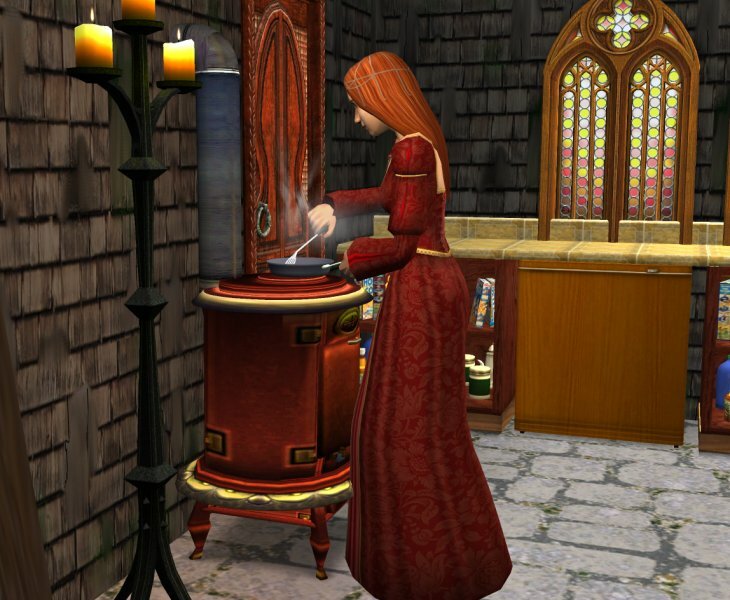 It fits many house styles: if your favourite family leaves in a castle, a victorian mansion, a "cowboy" retreat or a "trashy" house, finally you can dismiss any modern and expensive stove: your sims (and UNI students) have found the right appliance for them! You can use the Coal Stove as a normal stove with oven. 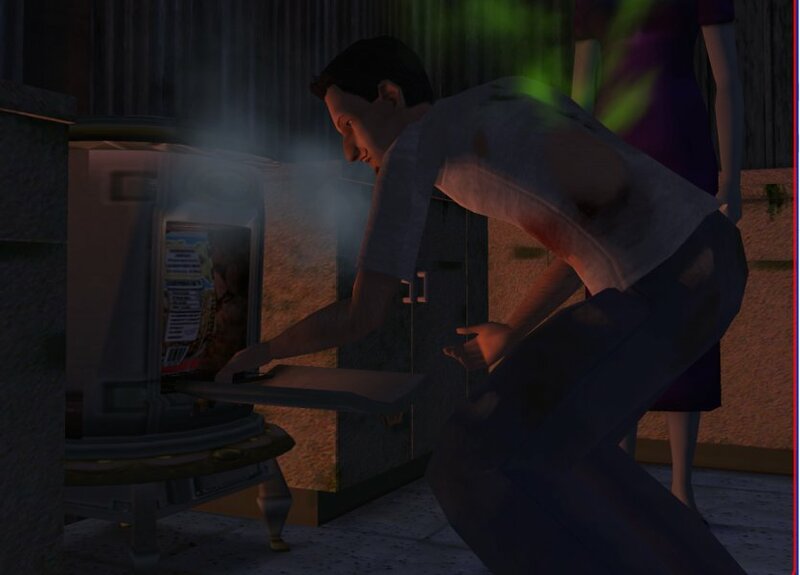 Plus, the sims will use it to dispose trash (like the trash compactor). Every time you throw something in the stove, it will emit a dense black smoke (from the chimney, too! ); the smoke will cease in few seconds. If the smoke doesn't stop (and - on the contrary - a green smoke can be seen in conjunction of the black one), this means that the stove is dirty: clean it, or you risk a fire!. 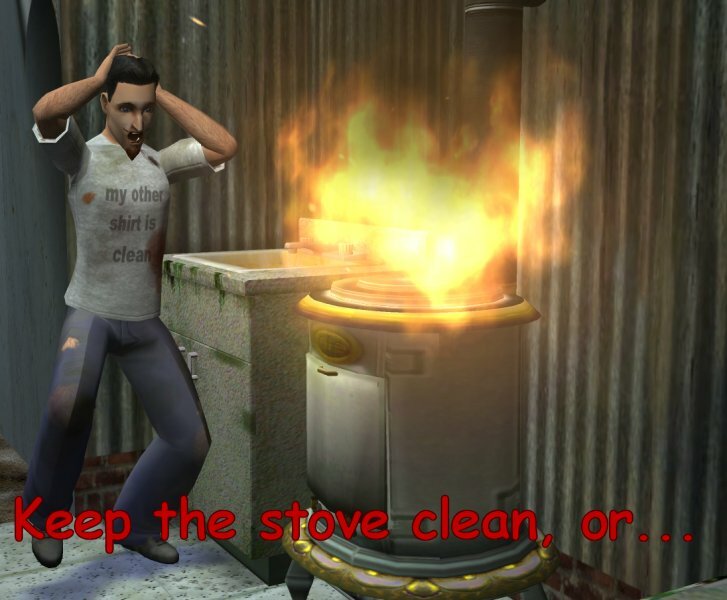 Your sims will LOVE to watch the trash burning in the stove, and often will open the lid to peek in (watch the suggesting trembling light flowing out of the stove every time they will open the lid ). The Coal Stove will be cleaned by the maid, if needed. Please note that children are not allowed to use the Coal Stove, nor for cooking (obviously), nor for disposing trash. Teens, young adults, adults and elders can use it at will. As usual, extract the package from the rar archive, and put it in the Downloads folder; remove the package to uninstall. Tthe Coal Stove work with any game configuration (but it doesn't have the special Business functions added with OFB). The mesh is a modification of the Maxis "Estomago" Pot Belly stove; the textures used by the Coal Stove are borrowed from the "Estomago" fireplace, and every recolour made for the "Estomago" will automatically apply to the Coal Stove, too. The animations have been taken from the cheap "Dialectric" range, and tailored to the Coal Stove. A heavy BHAV editing was needed in order to implement all the desired functions. This Coal Stove it's a very complex object: I've done my best to check and double check everything (a special 'thank you' to MaryLou for the beta-testing ), but obviously you might find little glitches or problems; in this case, please let me know. Credits to Maxis for the original mesh and for the textures. Credits to Numenor (that's me! ) for anything else. DO NOT CLONE! DO NOT REPOST ON OTHER SITES! You can create recolours for the stove (you have to recolour the "Estomago" stove, actually), and you can post your recolours anywhere. You can include the Coal Stove in you lots, but only if you upload the lot to FREE sites, give credits to Numenor and PUT A LINK to this thread.